The New Age Movement, what does it teach? Find out with Eric Barger on the show Christ in Prophecy. Last aired on August 8, 2010. Dr. Reagan: What in the world is the New Age Movement and how does it threaten the Church today? And why do many people believe that Oprah Winfrey has emerged as one of the premier leaders of the movement? For the answer to these questions by one of Christendom’s foremost experts on cultic movements, stay tuned. Dr. Reagan: Greetings in the name of Jesus our blessed hope, and welcome to Christ in Prophecy. I am delighted to have back with me again this week my special guest Eric Barger. Third week you’ve been here Eric. Eric Barger: It’s great, feels like an old hand now. Dr. Reagan: I am also glad to have Nathan Jones with us to help interview Eric. Nathan is our Web Minister and he is on that site everyday of the week for about 8 hours. Answering questions and talking with people all over the world, so if you want to get acquainted with Nathan just e-mail him through our website, ask him the question that you have and he will be back in touch with you. Nathan, why don’t you start off with the first questions. Nathan Jones: Sure! Well, your story is so interesting. Your testimony and all you started off in the church as a Christian and then somehow you ended up in the New Age Movement which isn’t Christian. How did the transition happen? And, again, I am still a little nebulous about the New Age Movement. What is the New Age Movement? Eric Barger: Well the transition took place, I came out of a liberal church background. I say liberal, I was unsaved but I went to church and I’m not sure the Gospel is preached there faithfully it may have been I am just not sure. I just never meet Jesus there, no one every challenged me about a personal relationship. When I was about 13 years old I started playing in rock bands every Friday and Saturday night, I would be out playing some place. I was actually thinking about playing my first band when I was 11. Eric Barger: Yeah, a local DJ heard about us, and I was kind of an anomaly at that age you know to be out playing in a band. But that is where it started, and by the time I was 16 or so I was a full blown drug addict, by the time I was 21 I was involved in New Age Philosophy. I moved to Seattle, a lot of New Age philosophy in Seattle, it became my religion. Now I would have still said there was a God, and I believe there was probably a guy named Jesus, that kind of thing. But I had adopted Eastern Mystic philosophies and techniques the arrow sticks, which you throw it is a form of fortune telling. The I Ching which is a book that explains to you life, you know from an Eastern viewpoint. And so I was into those kinds of things. I was very much into astrology charts, it wasn’t a little tiny thing in the newspaper. By the way I used to be an Aries and now I am a Christian. But it wasn’t a little thing in the newspaper. This was a scroll that had been made for me by a lady, I use that term very loosely who was a bona fide black witch and I literally would follow it, I was so superstitious by this it controlled my life. When I was playing in the band I would literally would not go out of the hotel room door until I knew what my stars said for that day. Eric Barger: That is where I was at. Nathan Jones: Because stars and planets determine your life? Eric Barger: Exactly, you know even though those things have no bearing on it. The God who created me and controls my life He created those stars too. I don’t need to look up at the stars I need to look to the One who made them you know. And a lot of people today, I meet Christians all the time who will make some statement about, “Oh well he is a Libra and he will do this and he will do that.” And I go, “No that has nothing to do with it.” You know people don’t realize where they are putting their faith and trust. Nathan Jones: So, is astrology a major component of the New Age Movement? Eric Barger: It is more so the occult, but many things that are occultic flow into the New Age, and many things that cultic also flow into the New Age. And in the occult it is all in that genre of rebellious spiritualism that is maybe the best way to define it. Dr. Reagan: Well how would you define the New Age Movement, it just seems so difficult to get your hands on it, it is so amorphous. Eric Barger: I’ll give some definitions that I think one of these will stick with people. It is a Westernized form of Eastern Mysticism. Dr. Reagan: Okay, very well put, yeah. Eric Barger: And often time is not taught with the Maharishi or a figure like a bong wan or an Eastern Mystic leader now it is taught with a College Professor and it is taught in business courses in our colleges. But it is a Westernized form, it is put in our words. Some of the teachers and leaders on the PBS Network, we can start naming them by name, which I do in the DVD’s and in my seminars, are teaching these things. And you look to who their leaders and their gurus are, are Eastern Mystic gurus, but they are now Westernizing this teaching making it palatable to us and therefore making a fortune. Dr. Reagan: So does this get into Pantheism? Eric Barger: It certainly does, you know there are many, many gods or that you have become part of one ethereal god force. Nathan Jones: Which is Hinduism, right? Eric Barger: Yes, very much so, but Hinduism and Buddhism both flow in those. Most Americans wouldn’t say I am a practicing Hindu but many have adopted those philosophies as a way of life. Dr. Reagan: Would you put the teaching spiritual teachings of Shirley MacLaine, for example into the New Age category? Eric Barger: Certainly, she is out on a limb just like her books says. Dr. Reagan: I am god. Eric Barger: It is also a spiritual experience without the cost of repenting of your sin, and probably the best definition I can give is: any system of belief that tells you to look inside of yourself, to yourself for enlightenment, wisdom and power is generically New Age. Now we look to the Holy Spirit who lives in us for enlightenment, wisdom and power. But we are not god. In the New Age, you look to the spark of god, the god force within you for enlightenment, wisdom, or power, it is a very close counterfeit. And this is across the board today, doctors, lawyers, scientist, PhD’s, Nobel Prize winners, people of politicians, people of high mental capability. Okay I guess we can take the politicians out of that group come to think of it. But people of high mental capability who believe in these philosophies because it works, and just because it works doesn’t make it right. New Age philosophies do work, because they are spiritually powered, they work, but by what spirit it works should be the question we ask. Nathan Jones: It works in the here and now, but for eternity it doesn’t work. Eric Barger: No, not at all and that’s the thing people want it now. Of course we live in a culture that if the one drive-thru across the street isn’t fast enough we drive across to the other one that is faster that is where we are as a culture. Dr. Reagan: Well it seems to me that there is an overwhelming, the New Age Movement indicates an overwhelming need of people to have something spiritual in their lives. They want some sort of spiritual expressions but they want one that makes no demands on their life. Dr. Reagan: I mean this is the Hollywood religion, owe yes I am very religious, I sit and I meditate, and I hum and I do all of this, but I don’t have any demands on my life in terms of morality or whatever. Eric Barger: Jesus calls us to come to God through repentance. The New Age Movement doesn’t like that idea. Our culture doesn’t like the idea. We want a spiritual experience without the cost of repentance of our sins. Dr. Reagan: Well that happens to be one of the most unpopular words in all of Christianity today. Dr. Reagan: You flip on TV and you see ministers of some of the largest churches in American who would never mention the word repentance, because it might offend somebody. Dr. Reagan: Or that they are sinners. Eric Barger: Exactly those words are all left out in many Christian circles but that is, that is the core message of Christianity that is being cut off at the knees. Dr. Reagan: So Christianity itself is being impacted by the New Age Movement. Eric Barger: It is, it is and do you know why, because our culture has adopted the gospel of self as a religion. Nathan Jones: How many churches are holding Yoga, that is what gets me. Yoga now is becoming a mainstream class offered in churches. Eric Barger: That’s big in emerging circles. I heard Rob Bell and Doug Pagitt both recently speak about how Yoga is so transforming. Nathan Jones: Empty yourself out, when we should be filling ourselves with the Holy Spirit and the Bible and thinking on these things. We are emptying ourselves so we don’t think of anything. Eric Barger: Rob Bell went as far, and he is an emergent leader from Michigan to say that we should listen to the message of the Yoga masters. Now wait a minute, I know about that, and yet his congregation seems to buy into this because many of them have no church background. You can have a big congregation but it depends on what type of Gospel you preach when you get in there. I will take 10 people who will turn a community upside down for the glory of God, over a thousand who will sit there and do nothing and never, ever make it to Heaven. We want those 10 who will actually go out and evangelize with the Gospel not with a false counterfeit. Dr. Reagan: Reminds me of a sermon that I heard here in this area by a Hispanic preacher who was talking about what is a live church. And he said, “We often think a live church is one that has lots of activities going on.” He said, “The other day I opened the newspaper and here is a major denomination in our city and they are offering Yoga classes, Transcendental Meditation classes and all kinds of Eastern, Oriental, Mystical things that have spiritual significance to them, they are not just neutral. And he says, “Lots of activities going on, but he says, “It is just spiritually dead.” He said, “Folks it reminds when I was a kid and living in Mexico once a week we went to Grandma’s house and we looked forward to it on Sunday because she had chickens and we got meat once a week. And she would go out to the back yard and she would grab a chicken and she would pop her wrist, and pop that chicken’s head off and it would run all over the yard. Said it was the liveliest and active chicken in the yard and it was the deadest.” Now brother that preached. Eric Barger: That is great, that is great, let me write that down, new sermon title, dead chicken will preach. Dr. Reagan: Dead chicken that is real active, you know. It is just, it is a lack of discernment that people just don’t seem to understand that something like Yoga and this sort of thing has spiritual significance. Eric Barger: It most certainly does no doubt about it. And those who have brought this into our culture and now it has seeped its way into the church. Hey if a church doesn’t stand for good doctrine, if we don’t have a standard that is the Bible being the truth we follow, and the only truth we follow, this other stuff is going to make in the door, it is just that simple. Dr. Reagan: And I am reminded of this I think, I guess it wasn’t a novel but it was a sort of self-help book, The Celestine Prophecy wasn’t that a New Age type of book? And I saw Christian everywhere reading this thing. Eric Barger: Yeah, yeah. Well you take a look of the reading, I was in a well known national chain print shop recently, a whole book rack there of self-help books. And I went down through them and I went I can find one Christian there throughout all of these books and the rest of them every one of them I could name to you as somebody that has adopted Eastern philosophies and put it into a Western context as a New Ager. So this is the stuff that is being sold to us as the way to control the problems or the things in our life, to get what we want to think and grow rich ideas. Eric Barger: The idea that we can, we are going to make it through life and be more popular people and be more powerful around people by using these techniques, so it works, yeah. But let’s never forget atomic bombs work, just because they work doesn’t make it right, you know. Nathan Jones: That seems to be the theme that you have talked about – the New Age and the Emergent all these – everything seems to go back to the sin that Adam and Eve committed when Satan said, “You will be like gods.” Everything you have said about this replaces God with us. Nathan Jones: And we buy into that. Eric Barger: That is exactly right. I think the five major doctrines even though New Agers would never claim to hang the doctrine, but the five major belief systems inside the New Age coming right out of Genesis 3:1-5 the Fall of mankind, starting with the very first Trans channeling or mediumship or séance in history. The devil possessed the body of a serpent and spoke to Eve the same as a medium gives over the use of his body to a spirit to speak to people today. I mean that is the first séance that we have ever seen in recorded history and that is where the lie came from, just like the same lie is being perpetrated in New Age séance. Dr. Reagan: Several years ago I read a New Age book that just astounded me, it talked about the fact that the masters of the universe have been channeling to New Age philosophers. And one of the things they’ve told them is that time is coming in the very soon future when those who live by faith will be taken out so that those who live by reason can continue in their evolutionary development and develop the world and the earth and all this. And I thought man this is going to be a New Age explanation of the Rapture. Eric Barger: Oh, most certainly, the Devil reads the Bible, the Devil knows. Dr. Reagan: And they will be able to say, “Hey we told you this back in 1970 we told you this in ’75 this is what happened. Eric Barger: Yeah the Devil is a Bible expert no doubt about it. Look at the most famous transchanneler in modern history is J.Z. Knight but the name of the demons she channels Ramtha is more famous then her. I mean she has been doing that for over 30 years, I saw a clip on YouTube recently when she is on the Merv Griffin show and she is talking to Merv Griffin as herself, and they go out to break and come back and Ramtha has shown up while they are at break. And this is a mans voice now speaking out of this woman’s body. Now whether it is fake or not it is just like Saul in 1 Samuel 28, he went to the witch of Endor, whether that was Samuel or not that spoke to him, he died the next day for even trying to contact the spirit realm. Folks we are not to be involved contacting any spirit in the spirit realm except the Holy Spirit of God. Eric Barger: All other spirits that do not confess Jesus Christ as Lord, whether they be angels or spiritual beings, they are demonic spirits they are counterfeits. And our world today is loaded with people looking for anything. They think a spiritual experience validates the idea that it must of come from God, it must be good. They forgotten or didn’t know that Satan comes as an angel of light. Dr. Reagan: Welcome back to our interview with Eric Barger, who is the Founder and Director of Take a Stand Ministries. I like that name, we desperately need to do that in this day and time, take a stand. Now Eric I heard an expert on the New Age Movement recently make a startling statement and I want to read it to you because I want to get it right. He said, “The largest church in the world is preaching New Age philosophy, and the pastor of that church is Oprah Winfrey.” What did he mean by that? Eric Barger: Well she is the most influential New Ager out there, by far the most famous New Ager. Ten to twelve years ago I began to make off the cuff statement in my seminars that Oprah was a New Ager, and I took a lot of heat for it. Eric Barger: Phone calls, letters, and then later on when e-mail became popular, e-mails telling me, “No Oprah is a Baptist.” You know and people defender her, these are Christians defending her. And I am going, nope what Oprah is teaching is New Age and eventually we will all know. And now we do know. Dr. Reagan: Well she just finally came out of the closet. Eric Barger: Completely, completely came out of the closet this year. And I want to preface anything we say now or anything we have said about the Emergent Church and others the last show we were talking about in the last program, this is not about good person versus bad person this is about truth versus error and that is what apologetics is, it’s the study of what truth is against what error is. And it’s not that we hate anybody, we are praying, I pray for Oprah Winfrey nearly everyday that she would be saved and think about the impact that she could have. Dr. Reagan: And I found that people often respond to any criticism of her by saying, “Look at all the good work that she does.” And she does a lot of good works. Dr. Reagan: And denied that Jesus was the only way to God on her program. Eric Barger: She is arguing with two audience members, saying that there couldn’t possibly be just one way, there are millions of ways that was her exact words you know. This is a headline from US Today, we will probably put this up on the screen, Cultural Agenda is Set by Oprah not Religious Leaders. Dr. Reagan: And that is true. Dr. Reagan: Recently Oprah has really begun to actively and aggressively teach New Age Philosophy right? Dr. Reagan: Not only on TV but mainly on the Satellite radio, right? Eric Barger: Satellite radio and the Internet but now on TV. She is coming out of the closet. Dr. Reagan: Who are some of the gurus she is using? Eric Barger: Well Eckhart Tolle, and his book A New Earth, she made him an instant millionaire. He was a well known New Age author before, but he is not the only one she has had on there. She promoted and really brought out to the public the book, The Secret, three years or so ago. And all you would have to do is go to the websites of the authors of The Secret, to see what this was. It was a mix of the Kabala and Gnosticism and Rosicrucianism and she helped to promote that idea. She has also had on her XM satellite radio channel a lady named Esther Hicks who is a transchanellor, who channels who channels several entities who all call themselves Abraham they are different to her. Now this must be confusing at Thanksgiving dinner. Dr. Reagan: There are several Abrahams? Eric Barger: Several Abrahams but that is one of them and this lady has also been on our TV show and Oprah has probably has done more to promote the old New Age philosophy of A Course in Miracles then anybody else. Eric Barger: Because she has brought Mary Ann Williamson to her website and to her TV set, now Mary Ann Williamson is doing a devotional everyday during 2008 on Oprah’s XM radio network that came right out of the Course in Miracles. And Mary Ann Ramson has written a book about it, she is unity minister by the way, which is not a Christian denomination. Eric Barger: It’s a cult my mother was involved with for 25 years before she got saved, and tragically passed away. But, so I know all about Unity and that’s Oprah is promoting this. Dr. Reagan: I know for a long time there Oprah continued to say that she was a Christian but does she even claim that anymore? Do you know? Eric Barger: She doesn’t claim that at all, you know, she doesn’t claim it at all, and she is bringing the heaviest hitters in the New Age Movement. Dr. Reagan: Well I didn’t know that. Eric Barger: Because he wanted to be connected forever with a 14th Century occult mystic named Meister Tolle or Meister Eckhart, sorry. I mean that’s how deep this guy is, he is into all kinds of mysticism. And he says, the first thing when you ask him his influences he says, A Course in Miracles and that is something a common theme throughout all these New Age leaders and authors today. But here is Oprah turns to him and says to him, “So if your God is a believing experience it really is not God because God is a feeling experience and not a believing experience.” And folks if you go on your feelings you will be deceived; if you go on the absolute truth of God’s Word you will never be deceived. Dr. Reagan: Amen, brother preach it. Dr. Reagan: Eric the Bible says that in the End Times right before the return of Jesus we are going to enter into a period of great deception. And it seems to me that we are in that period and it seems to me that one of the greatest needs in the church today is discernment. How can a person become a more discerning Christian because all of us are capable of being deceived? How can we be more discerning? Eric Barger: There is no short cut for sound Bible study, there is no short cut for the preaching of the Word of God. I say enough with the programs, enough with the spin doctors from the pulpit. That we come back and teach the Word of God to our people because as you said privately to me there is a famine of the Word. And there is a famine of the Gospel today amongst our people. I am talking about in evangelical circles. Places that say they believe the Bible let’s preach the Word of God, enough of the programs. Come back to the Word. Look at what is happening in the lives of the people and tell me there isn’t a need. Dr. Reagan: And it’s not just the responsibility of the preacher or the teacher, it is the responsibility of each of us as Christians to study. Dr. Reagan: You know you are talking about what my colleague Dennis Pollack used to call the 5 letter dirty word, STUDY. Dr. Reagan: And people just don’t want to. Eric Barger: That is because we have allowed Television and everything else to get in our way. Nathan Jones: But, they can watch this show. Eric Barger: Obviously we are not against TV, we’ve got my DVD sitting here, we’re on TV right now. That isn’t, the point is that we’ve have forgotten what the on/off button does we let everything get in our way. We let, well I am going to get on somebody, we let Sunday morning soccer tournaments get in our way. We let all this other stuff get in our way from being first of all constant in the church, but maybe more important, constant in the Word of God. If you had to look at what’s the most important thing knowing the Word because from there everything thing else emanates that we are supposed to be. Dr. Reagan: Well the bottom line is you can just never become a discerning Christian if your only spiritual experience is one hour a week on Sunday morning. Eric Barger: I never forget when I was a youth pastor I had a distraught mother come to me and say, “My son is doing all this stuff, can’t you do something about it?” I said, “Ma’am, I only have him for an hour on Friday nights, I can not replace what the school system has taught him, what his friends have done to him, what is happening in the home.” I mean she looked at me like, I thought you were the problem fixer, the problem solver for my son’s problem. And it is the same with us as adults. 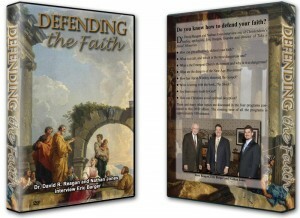 Dr. Reagan: When I first became acutely aware of this problem of discernment was when the Barna polls began to, I began to read those concerning the freshman in evangelical colleges and universities coming out of evangelical churches who could not even name the four Gospels or name 2 of the Apostles. Eric Barger: Yeah, you don’t dare ask them where Philemon is. Yeah. Dr. Reagan: And you ask them, and then you begin to wonder what are they doing in these churches just weenie roasts? Eric Barger: Yeah, yeah, it makes you wonder and that is part of it, that is certainly part of it, but this is also the Era we live in. We live in the time when the Apostle Paul said to the Thessalonians that the mystery of iniquity would abound. Eric Barger: That is a mysterious, occultic, direct affront to the Word of God that’s what those words mean, the mysterion of anomia, mystery of iniquity. When He said that is something behind that, when the occult rises up, and I have a whole DVD and message about this, when we see the rise of the occult we know that is a prophetic sign that has to happen just before the return of the Lord. At the same time there is going to be this famine of the Word of God, where we have a lot of people that have a form of godliness but deny the power there of. Eric Barger: We see these things. To the Christian, to the Pastor, to the Sunday School teacher, examine what you are going to present to the people, examine what you take into your heart. It’s fine to read other books then the Bible, but if the Bible isn’t being read, do you really have time to read another book? Dr. Reagan: Well it seems to me, test everything, test it by the Word of God. Dr. Reagan: And if you don’t know the Word of God you can not test it, but you’ve got to test it. The fact that a person gets up and who is smooth and charismatic and dynamic, and can speak well, and mentions Jesus name a whole lot of times, does not necessarily mean that he is teaching the truth. And maybe 90% of what he is saying is absolutely true, but it is just that 10% that is so off base, you’ve got to test it. Paul complemented the Bereans for testing everything that he taught by the Word, and he was an Apostle of God. How much more should they test what you teach and what I teach? Eric Barger: Oh, I invite people, I say this so often when I am teaching to test what I’m telling you, to test what I am teaching, to test what I have on the screen behind me in my seminars, to test what I am saying. And if you do you’re going to come out there ahead, more Biblically sound. We need Christians who will test through the Word of God, use the Word of God as the strainer to strain everything through, now we are going to get into this. Dr. Reagan: Brother you have got some wonderful materials on your website that you have produced to help people to be more discerning. So would you just look into that camera and tell people how they can get in touch with your website. Eric Barger: I appreciate that. It is ericbarger.com, E-R-I-C-B-A-R-G-E-R.COM or course www. And for those that do not have web access you can call us at 214-289-5244, we would be glad to send you an informational package. Dr. Reagan: Mention that telephone number one more time. Eric Barger: It is 214-289-5244, and that is our office line, just leave a message if we don’t answer we will call you back. Dr. Reagan: And you have quite a variety of materials, videos, pamphlets and so forth that they can order. Eric Barger: We’ll send a free packet of information with some past newsletters and that kind of thing. Dr. Reagan: Well that’s great. Well Eric I want to thank you again for being on this program and you know I would like to ask you to come back for a 4th week. Would you be willing to do that? Eric Barger: Well I started to say a minute ago, I would love to get into one thing that we’re going to talk about here. Dr. Reagan: Because I would like to talk about many roads to God and some things like that.